By default, the Canon EOS 77D camera’s Live View display offers the data shown on the left when you’re taking photographs; in Movie mode, the default display appears as shown on the right. Black bars appear at the top and bottom of the movie display to indicate the boundaries of the 16:9 movie frame. As is the case with other information displays, the type and amount of data that appears depends on your exposure mode and whether the camera is set to take still photos or shoot movies. Here’s a look at the default Live View display for photography (left) and movie recording (right). You also can vary the amount of data that appears in either display by pressing the Info button. This figure shows the four alternative displays available for photography. In Movie mode, the Histogram display isn’t available. Press the Info button to change the type of data that appears during Live View shooting. Additionally, you can add one of three grids to your screen, which can be helpful when checking alignment of objects in the frame. To enable or hide the grid, open the Shooting Menu and look for the Grid Display option, featured here. As with other menu options, where you find this one depends on your exposure mode: In P, Tv, Av, and M modes, the option lives on Shooting Menu 6, as shown. 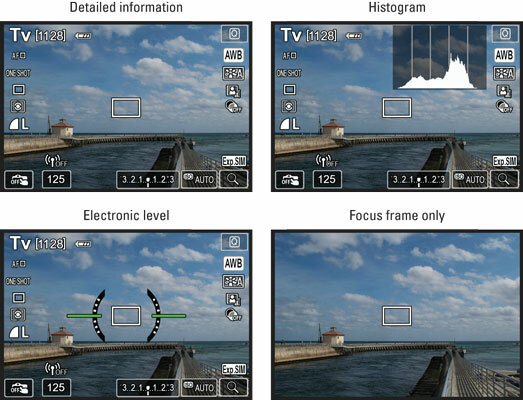 In other still photography modes, it’s found on Shooting Menu 2; in Movie mode, Shooting Menu 2. Through this option, you can add one of three alignment grids to the screen. • The white box or corner markings represent the autofocusing frame. The appearance of the frame depends on the AF Method. At the default setting, Face Priority + Tracking, the frame appears as you see on the right in the following figure. In Live One-Point AF mode, the frame looks like the one on the left earlier; in Smooth Zone mode, the frame appears as shown on the right in the same figure. To activate Quick Control mode, tap the Q symbol or press the Q button. Check the areas labeled to view the battery status. The symbol shown in the figure represents a full battery. The number of shots remaining or the available movie recording time appears next to the battery symbol. The chart that appears in the histogram display (upper-right screen) is a tool you can use to gauge exposure. Note that when you use flash, the histogram is dimmed. The histogram can’t display accurate information because the final exposure will include light from the flash and not just the ambient lighting. In addition, the histogram dims when you use M (Manual) exposure mode and set the shutter speed to B (Bulb), which keeps the shutter open for as long as you hold down the shutter button. The camera can’t predict how long you’re going to hold that button down, so it can’t create a histogram that will reflect your final exposure. Also note the Exposure Simulation symbol that appears in the first three displays. (Look in the lower-right corner of the frame.) This symbol indicates whether the monitor is simulating the actual exposure that you’ll record. If the symbol blinks or is dimmed, the camera can’t provide an accurate exposure preview, which can occur if the ambient light is either very bright or very dim. Exposure Simulation is also disabled when you use flash.